Originally published under the title "The Anti-Israel Movement's 'Anti-Normalization' Campaign." 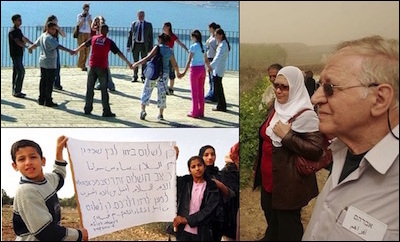 Anti-normalization activists loathe coexistence organizations like the Parents Circle - Families Forum (PCFF), which brings together Israelis and Palestinians who have lost family members in the conflict. The basis of any negotiated settlement is compromise. But what if one of the parties to the conflict simply refuses to talk? Some Palestinian factions and the Boycott, Divestment and Sanctions (BDS) movement have engaged in what's known as an "anti-normalization" campaign: they are demanding that all contact between Palestinians and Israelis be severed, lest they "normalize" the existence of Israel. The reciprocal response by Israelis and American Jews is denial. The idea of anti-normalization originated with Arab nationalists during the 1970s and was then picked up by Islamists like Hamas and radical Marxists like the Popular Front for the Liberation of Palestine. At every stage of normalizing Palestinian relations with Israel — especially during the 1990s, when negotiations were taking place — extremist factions opposed the very idea of talking with Israelis. It is now a mainstay of the BDS movement. That anti-normalization is first and foremost a Palestinian strategy against other Palestinians cannot be denied. Gaza BDS activist Haidar Eid recently complained that the Palestinian Authority was "authorizing pro-normalization American organizations, such as One Voice, Seeds of Peace or the Peace Alliance, which was established after the Geneva Accord, which gave up the right of return of the Palestinian refugees" to operate in Gaza. 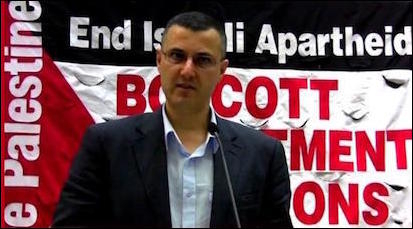 BDS leader (and Tel Aviv University graduate) Omar Barghouti went further and lamented that the Palestinian Authority, as well as other Arab states, were not toeing the line against Israel: "If official Palestinian normalization had not reached this level, nobody would have dared to host Israeli delegations in Saudi Arabia, sports delegations in Qatar, trade delegations in the UAE, and delegations in Bahrain, Morocco and so on. Official Arab normalization has reached critical proportions." BDS leader Omar Barghouti laments that "official Arab normalization has reached critical proportions." In an era when Syrians have died by the hundreds of thousands and Iran is poised to develop nuclear weapons, BDS activists are upset that Arab states have moved on from their cause. Perhaps because anti-normalization is having no success in the West Bank or the Arab world, it has become the official policy of the BDS movement in the U.S. The National Students for Justice in Palestine (SJP), whose parent organization, American Muslims for Palestine, was recently shown to be connected to the same American Muslim Brotherhood supporters who funded Hamas through the Holy Land Foundation, has long trained its activists in "Countering Normalization of Israeli Oppression on Campus." The New York City SJP chapter's manifesto states, "We reject any and all collaboration, dialogue and coalition work with Zionist organizations through a strict policy of anti-normalization and encourage our comrades in other organizations to do the same." BDS activists in New York have taken this to heart by, among other things, crashing faculty meetings to demand "Zionists off campus." Their continual harassment of Jewish students and disruption of campus life has prompted New York state legislators to call for their suspension and helped push Governor Andrew Cuomo to ban the state from doing business with companies that boycott Israel. Even informal contacts are off limits. Palestinian poet Remi Kanazi made the position perfectly clear in his poem, Normalize This: "No, I don't want to normalize with you I don't want to hug, have coffee, talk it out, break bread, sit around the campfire, eat s'mores and gush about how we're all the same." The anti-normalization strategy plays out time and again as SJP chapters have exercised a hecklers' veto over campus events organized by Jewish and Israeli organizations, including those that highlight Israeli-Palestinian co-operation. Without communication, and normalization, peace is impossible. And that's precisely their goal. To see Israeli denial over anti-normalization in action, consider a recent incident where members of the Israeli leftist group Two States, One Homeland entered Ramallah during Ramadan to share an Iftar meal with Palestinians, only t0 have rocks thrown at them and their cars torched. In response, the group issued a statement saying, "One of the vehicles was apparently set on fire and slightly damaged while it was empty. The Palestinian security services quickly took control of the incident and helped us file a complaint. Despite the reports, we did not at any point feel threatened and our Palestinian friends were horrified by the incident. The scariest thing for those who wish to maintain the status quo is Palestinians and Israelis speaking and working together." If rocks and burned cars don't convince these people that anti-normalization is real, what will? This co-dependent relationship — Palestinians refusing to engage in a dialogue with Israel, in order to make it disappear, and Israeli Jews denying that this is actually a Palestinian strategy — works against communication and peace. That it has spread to American campuses, along with low-level violence against Israeli and Jewish groups, is ominous. Recognizing anti-normalization for what it is — repression against the majority of Israelis and Palestinians who genuinely want peace — is the first step toward resuming what has been necessary all along: an honest dialogue that's free of guilt and threats. Asaf Romirowsky is the executive director of Scholars for Peace in the Middle East (SPME) and a fellow at the Middle East Forum. Alexander H. Joffe, a Shillman-Ginsburg fellow at the Middle East Forum, is a historian and archaeologist.